By Robinah Kyambadde, YWCA of Rwanda. Robinah is attending the International Conference on AIDS and Sexually Transmitted Infections in Africa (ICASA), as part of the World YWCA Delegation. My name is Robinah Kyambadde and I am the Youth Project Manager for the YWCA of Rwanda. For the last few days I have been in Cape Town, South Africa as part of a World YWCA delegation at the 17th ICASA conference. Since I arrived on December 2nd I have been very busy participating in various activities which have included a World YWCA Pre-Training and the ICASA Youth Pre-Conference. It has been an incredible learning experience and I especially enjoyed meeting and connecting with my YWCA sisters from Angola, Kenya, Malawi, Tanzania, Zambia, Namibia, South Africa, Switzerland, Zimbabwe, and Ethiopia. What interested me most was the intergenerational dialogue organised by SafAIDS and World YWCA. I was one of the young women selected to participate in the conversation. It was very exciting because people were also contributing their thoughts on twitter and it seemed like everyone was talking about issues that mattered to youth! From these discussions I learnt how best we can bridge the gap in the involvement of youth in designing, implementing and evaluation of youth programmes. The debate we had between the youth and the policy makers and different donors was a great opportunity for me to raise the burning issues for youth in Rwanda. In Rwanda young people cannot access adequate information on SRHR and those that can offer them information lack training. We need more mentors in Rwanda and we also need to talk to parents to change their mindset towards SRHR. I will leave this conference feeling more empowered and more comfortable to speak out. Throughout my time here I have had many opportunities to express myself and to therefore learn how to better vocalize issues on SRHR. This will be a very useful tool to me as I return back to Kigali to share what I have learnt. 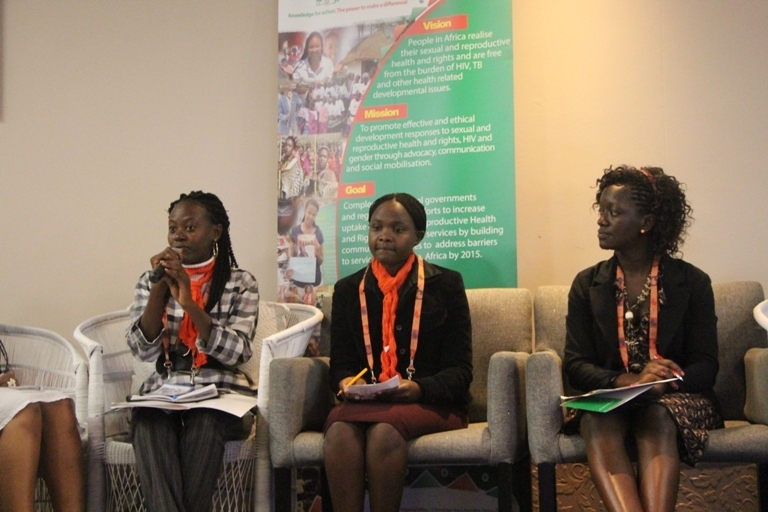 I have much better knowledge about SRHR and HIV/AIDS and the concerns of youth in Africa .With this conference, I have become more responsible than ever to fight against injustices that affect girls and young women, especially SRHR and Gender Based Violence. I have also come to understand that young people are not the leaders or tomorrow, rather we are the leaders of today, of now and we must continue to advocate for our human rights! I would like to take this opportunity to thank the World YWCA and our movement. Since I joined the YWCA of Rwanda in August 2013, I have been empowered and my work with girls and young women has inspired and shaped me tremendously. I really found in the YWCA a safe space for myself, and for the girls and young women. I am grateful to the YWCA of Rwanda and the World YWCA for making me a confident and empowered young woman.